Gilmour traces the development of the congressional budget process from its origin through the emergence of reconcilliation and Gramm-Rudman-Hollings. He shows how changes in process have brought about far-reaching shifts in congressional power, and explains why they have failed to control the explosion of budget deficits. Throughout the last decade budgetary issues have dominated the national political agenda as the deficit has skyrocketed to previously unimaginable levels. 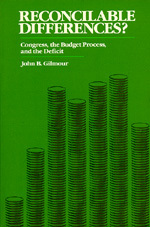 In this important book, John Gilmour traces the continuing quest of Congress over the last fifteen years to reform its budgeting system in the hope of producing better policy. He shows that the enactment of the Congressional Budget Act of 1974 and the introduction of the reconciliation procedure in 1980 have produced a budgetary system in which congressional majorities can get what they want, provided only that they can agree on a comprehensive budget policy. From his thorough analysis, Gilmour concludes that, while the reforms have not produced balanced budgets, they have eliminated procedural obstructions to the adoption of a coherent budget. New budget procedures have transformed the way Congress works. Before the reforms of 1974 and 1980, Congress had an extremely fragmented, disintegrated budgetary system in which the budget emerged almost haphazardly from the independent actions of numerous committees. Gilmour shows that reconciliation procedures in the budget process makes total revenue, total expenditures, and the size of the deficit matters of deliberate choice, consolidating decisionmaking to an extent unprecedented in the history of the modern Congress. Yet, despite the striking structural and procedural changes, and despite its highly majoritarian features, the budget process has failed to reduce dissatisfaction with congressional handling of money. Deficits have been larger, not smaller, and overall spending has gone up. Gilmour deftly shows that the massive budget deficits of the Reagan years were due primarily to the failure of the House, the Senate, and the President to agree on how to reduce spending or increase taxes enough to eliminate the deficit. Responsibility for budgetary failure, he argues, must rest with Congress and its inability to reach consensus, not on the new budget process, which, given what we can expect from procedural change, has been quite successful. John B. Gilmour is Assistant Professor of Political Science at Washington University.